I’m represented by Sara D’Emic of Talcott Notch Literary Services, and I am also a member of the London-based writers’ group The T-Party. 18-Sep-2018: Eradications has only been out a few weeks, but the first review is a good one! Here is the Amazon page, to see it in all its glory. 31-Jul-2018: For the past couple of years I’ve been engaged in a race with George R R Martin (he doesn’t know that of course) to see who can get their latest offering published first. And I’m glad to say I won! “Eradications”, the sequel to CREATIONS, is now available on Amazon in paperback and Kindle. This is also my first foray into military SF which I’ve always wanted to try – it was a lot of fun to write! It’s available here for ebook and here in paperback – for full details and blurb, take a look here. I hoped when I was writing CREATIONS that the subject would generate a high degree of interest, but to see real-life advances and research independently following the same directions I predicted is just amazing. I’ll be following this subject with a great deal of interest. 06-Jun-2017: One of the best feelings as a Science Fiction author is when stuff you predicted starts to come true. And in my case it seems to be happening. In CREATIONS I wrote about the implications of creating self-replicating machines, including how they might actually be designed and built, and the fact that technologies like 3D Printing and Additive Manufacturing might be central to their development. So sure enough, here is a link to a news story about the real-life research into this kind of tech. Dr Alex Ellery (associate professor in the Department of Mechanical and Aerospace Engineering at Carleton University, Ottawa) is behind the work. Right now they are trying to form complex electro-mechanical devices (like motors) using 3D printing, and they are looking at how raw materials representative of the constituents of lunar soil could be employed. Ascension (Here), Mind Games (Here), Contact Authority (Here). Great game. Realistic physics and takes an age to master. Better with later iPads that have the processing power to make it smooth. If only there were more missions! 10-Nov-2014: CREATIONS gets another Five Star review on Amazon! Sci-fi action capped with a brilliant ending. …I enjoyed Creations and recommend it for readers that might otherwise be reluctant to the sci-fi genre. The plot is action-driven and explores the plausible technologies available a quarter-century from now and their implications for humanity. And not to spoil the ending, but Mitchell definitely saves the best for last. 01-Nov-2014: Another CREATIONS review posted on Amazon – Four Stars this time! “Creations” is a book of great ideas. … “Creations” opened up for me ideas as to how the exploitation of space might be managed—and mismanaged. 02-Oct-2014: First Amazon review for CREATIONS – Five Stars! A good, fast read with great action and perfect ending. 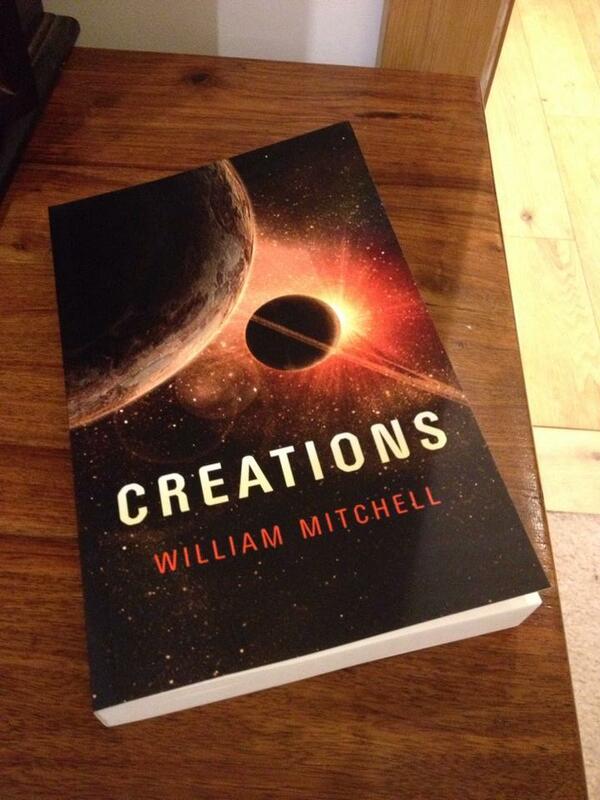 … I thoroughly enjoyed Creations, and would highly recommend it to anyone who enjoys science fiction. …The ending of the book is a fantastic “That was set up all along and I should have seen it coming”, and leaves you intrigued about where a sequel could go. The plot is clean, the characters fairly well developed and relatable, and importantly in a near-future sci-fi, the world is believable. …Mitchell does a really good job writing a fun, gripping, action-filled ending to the book. 6-Aug-2014: The YouTube trailer for SKY CITY FREEFALL is now uploaded and ready to view! For the video click below, and for the app itself, look here. Enjoy! 12-Jul-2014: I now have another iPhone/iPad app available on the App Store! SKY CITY FREEFALL is now live and ready for download. For more info look here, and the App Store link is here. Current pricing is $1.99 (US), £1.49 (UK) — watch out for giveaways and other offers. Also my author copies have arrived, and now, finally, I have the chance to see what it looks like in the flesh, something I’ve waited a long time to be able to say! Excellent and comprehensive lunar flight simulator. Very realistic and complete. The missions are fun and well laid out. Thanks to the well written tutorial, learning how to master the lander is both easy and fun! Recommended to all lovers of realistic simulations. 11-Aug-2013: Another good review for LUNAR SEARCH AND RESCUE, and a really nice one at that – Five Stars! Excellent, Five Stars … This has tons of depth and a great flight model. If you are into the Apollo missions it’s what you are after. 22-Apr-2014: More news for CREATIONS: the cover design is ready, and I think you’ll agree it’s breathtaking. I couldn’t have hoped for better, and it’s been described as “gorgeous”, “evocative” and “beautiful” since I started showing it around. The designers at John Hunt Publishing definitely excelled themselves this time. 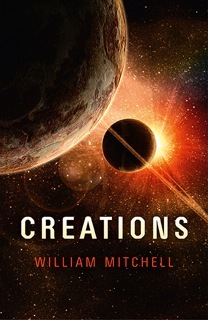 12-Dec-2013: The biggest and best news so far – I’ve just signed the contract paperwork for publication of my first SF novel, “CREATIONS“, which will be coming out sometime in the next 12 months. The publisher is John Hunt Publishing. Big thanks to my agent Sara D’Emic at Talcott Notch Literary Services for getting me this break! There’s a lot to do between now and the eventual release date (including copy editing, typesetting, cover design etc), but hopefully within the next year I’ll have it in my hands and it will be available for sale! 11-Aug-2013: A good review for LUNAR SEARCH AND RESCUE, on the App Store! Very realistic-feeling Moon simulator. Challenging…but super duper fun nonetheless … Some of the most exiting moments have been low-altitude flying where collision warnings have occurred. These have been unexpected surprises … For enthusiasts of games like Orbiter Sim, I recommend giving this a shot. I don’t know many sims like this in the app store, and I have found myself coming back for replays simply for the flight experience. 25-Jul-2013: Having branched out from writing fiction into writing games, my first iPhone/iPad app is now available on the App Store! LUNAR SEARCH AND RESCUE is now live and ready for download. For more info look here, and the App Store link is here. 02-May-2013: Another nice review of my Writers of the Future contest winning story “Contact Authority” is now up on the Dreaming About Other Worlds blog. The story is an interesting twist on the traditional alien contact story … in the end, I wanted to read more about the Alliance and the aliens that comprised it, which seems to me to be an indication that the story was successful. 16-Feb-2013: More praise for Writers of the Future Volume 28 on the Amazon review section. 25-Nov-2012: I’m happy to see that a good review of the Writers of the Future 28th anthology has been put up on Goodreads, and my winning story “Contact Authority” is one that the reviewer has picked out as one of the highlights! “Contact Authority” by William Mitchell was a good first-contact story with a twist. Nicely done in the first-contact aspects, and the galactic ramifications were interesting and well-thought-out. No text for this story, sad to say :(. But the story “Contact Authority,” which I’m listening to right now, is spectacularly awesome and I’m not nearly done with it yet. Can’t pass verdict on the other fiction selection in this episode, but this story is just too good to miss. 30-Apr-2012: Publishers Weekly has put out a review of Writers of the Future Volume 28, which makes special mention of my winning story “Contact Authority”. 30-Apr-2012: The UK-based podcast StarShipSofa has recorded my Writers of the Future winning story “Contact Authority” to audio, along with the Gold award winning story “The Paradise Aperture” by David Carani. I listened to it in full for the first time today, and it’s a great rendition of both stories! Well worth downloading, and big thanks go to Tony C Smith (who organises and presents the podcast) and Dave Robison (the voice actor who did the reading). To hear something read just as I imagined it as I wrote it, with every nuance preserved intact – great job guys! 29-Apr-2012: I’m now back from the Writers of the Future week in L.A. — the week was fantastic, and a full write-up of what I saw and did is here. The anthology itself will be available soon (in hardcopy and electronic form), which means that my winning story (Contact Authority) will be reaching the biggest readership I’ve had so far! Great news! 10-Oct-2011: Well, how do I put this one into words? Basically — I won! I now have a first place winner’s position in the L. Ron Hubbard Writers of the Future Contest, which is widely acknowledged as the contest to get into in SF and Fantasy writing. So some time next year I will be flying off to Los Angeles for the writing workshop and awards ceremony. Once, that is, the news has sunk in and I actually believe it myself! All in all, a good pretty result. The announcement itself is here. 03-Oct-2011: One of my historical horror stories, “Jiang Shi“, is now available to read in Something Wicked magazine. Seems ages since I had anything out in print (or electronic form in this case) so it’s good to have it finally published! 07-Sep-2011: For the second time I’m in the finals of the L. Ron Hubbard Writers of the Future Contest. As before I can’t say which story just yet (there are rules on anonymous judging which they stick to pretty hard, and rightly so) but I’m down to the final 8 from which the 1st, 2nd and 3rd place winners will be picked. Which means that so far in 3 attempts at entering I’ve had a finalist place, an honourable mention, and now another finalist place. Fingers crossed! 11-May-2011: Got some good news today — Joe Vaz of the South African horror magazine Something Wicked has accepted a story of mine. The story is titled “Jiang Shi“, a Lovecraftian horror set in nineteenth century China. Publication should be sometime later this year — more details nearer the time! 15-Dec-2010: Some encouraging competition news — I recently entered a contest run by New Scientist magazine where the challenge was to write a story of no more than 350 words “about worlds in which scientific theories we’ve long since dismissed turned out to be true after all”. The news is that I made the shortlist of 10 (from a field of around 700) which is pretty good. Unfortunately I didn’t make the final 3 (chosen by Neil Gaiman no less) but getting this far still justifies a minor celebration! The link to the NS blog post showing the 3 winning stories is here (I’m told the other finalists will appear in due course). 11-Nov-2010: More news on the Writers of the Future front: I got an Honourable Mention for my story “Ascension” which I submitted for the 3rd quarter of 2010. Of course getting to the finals again (or even winning!) would be great, but the certificate is welcome nonetheless. Will pin that up somewhere prominent when it comes. 11-Apr-2010: “The Turning of the Screw” (Midnight Street issue 12) gets an Honourable Mention in “The Best Horror of the Year”, compiled by Ellen Datlow (of Year’s Best Fantasy & Horror fame) published on her blog (link here — you might need to skip back a bit to get to the 11th April 2010 posting, but to get a mention alongside the name at the top of that horror-story-achievement-list, a certain Mr S. King, is pretty damn cool). 23-Sep-2009: Bummer — the story I had in the finals of Writers of the Future hasn’t been picked as a winner. However there is still an opportunity to be picked as a “published finalist” if the twelve 2009 winners form a shorter-than-average anthology. I’ll have to decide whether to go for that, then cross my fingers all over again while the third- and fourth-quarter winners are chosen (then hope that they pick shorter stories as winners, and that mine is the best of the also-rans). Congratulations to those that did get through, and I’ll post the news here if I’m lucky in the final sweep. 18-Jun-2009: Another review of “The Turning of the Screw” (Midnight Street issue 12) has been written, by Nick Jackson – reproduced on the Midnight Street website itself. 03-May-2009: Another review of “The Turning of the Screw” (Midnight Street issue 12) has been posted here on the SF Crowsnest site by Gareth D Jones. 29-Apr-2009: A review of my story “The Turning of the Screw” (Midnight Street issue 12) has been posted here on The British Fantasy Society website, by Steve Redwood. 17-Apr-2009: Midnight Street issue 12 is now out, featuring my story “The Turning of the Screw“. 08-Apr-2008: Short-but-sick “Sectioned” (widely regarded as the nastiest, most horrific piece ever to pass through my crit group) has sold to Midnight Street. 24-Jan-2008: A review of my story “Junk Wars” (Neo-Opsis Issue 13) has been posted here at The Fix online, by Marshall Payne. …A good helping of suspension of disbelief is required to enjoy “Junk Wars,” but nevertheless, I did. 22-Sep-2007: Neo-Opsis issue 13 is now out, containing my story “Junk Wars“. 07-Jun-2007: Humorous SF short “Junk Wars” has sold to Neo-Opsis magazine. 21-May-2007: Another review of “Horrors Beyond” has been posted on the Amazon.com site (here), by a reviewer logged in as “Brian”. 26-Apr-2007: Another review of “Horrors Beyond” has been posted here on the SFReader site, by Jeff Edwards. 28-Aug-2006: A welcome bit of critical acclaim — the 2006 Year’s Best Fantasy and Horror has given an honourable mention to my story “His Wonders in the Deep“, published in the Elder Signs Press anthology “Horrors Beyond”. 08-Mar-2006: Gothic Fairground Slaughterfest (not my description!) “The Turning of the Screw” has sold to Midnight Street. 15-Dec-2005: The Book of Dark Wisdom Issue #7 is now out, containing my story “Second Sight“. 01-Aug-2005: Chance meeting with an existing member leads to me joining The T-Party writer’s group. 29-Jul-2005: Another review of “Horrors Beyond” has been posted on the Amazon.com site (here), by John W. Oliver. 25-Jul-2005: Two reviews of “Horrors Beyond” have been posted here on the Nightscapes site, by Matthew Carpenter and James Ambuehl. 23-Jun-2005: A review of “Horrors Beyond” has been posted here on the LSU site, by Mario Guslandi. 01-May-2005: In print at last — Elder Signs Press have released their anthology “Horrors Beyond”, containing my story “His Wonders in the Deep“. Got my contributor’s copy and am impressed — the quality of the other stories and the quality of the book’s overall design and printing are as good as I’d expect from a big name publisher. 25-Feb-2005: Another Lovecraftian horror — “His Wonders in the Deep” has sold to Elder Signs Press for their “Horrors Beyond” anthology. 24-Oct-2004: First news item for this site, and first sale: Vatican-based Lovecraftian horror “Second Sight” has sold to The Book of Dark Wisdom.